For large-scale projects involving banners, signs, backdrops, visuals, posters, displays, blue prints or CAD drawings, borrowing the expression from the late-90s Pontiac commercials, wider is better. That is why we offer wide format scanners and printers suitable for many vertical market needs, able to serve in architectural, engineering and construction businesses, as well as in manufacturing, government and education environments. 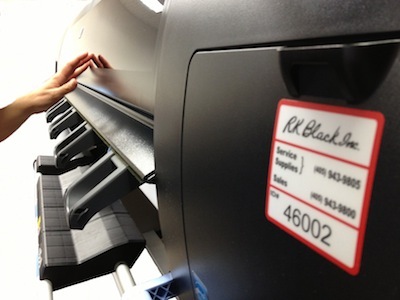 Available through R.K. Black are wide-format imaging multifunction printing systems (MFPS) able to handle any business documents larger than 11” x 17” up to 36” x 1180”, for example, with up to 600 dpi printing resolution and scan to USB and SD card capabilities. To see our wide-format solutions from Ricoh, Kyocera and our other technology partners, please give us a call at (405) 943-9800 or click on the red button below, fill out the quick and easy form and we'll contact you shortly.